The following information was revealed to me through vision quest ceremony (via the Spirit of the White Raven) on the top of Mount Lone Cone, Meares Island, British Columbia, Canada. The vision culminated in November of 1996. 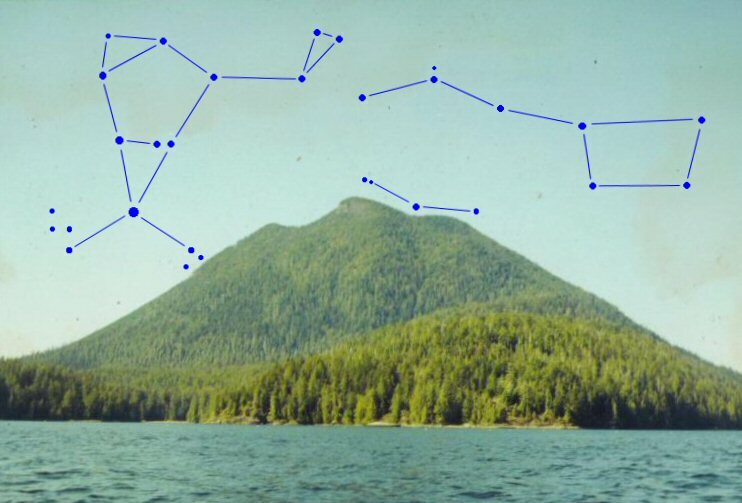 This is Mount Lone Cone (the “Giant Dragon’s” Head) on Meares Island, British Columbia, Canada viewed from Lemmens Inlet showing the approximate location of the Bootes, Ursa Major and Canes Venatici constellations on the northwestern horizon at sunrise in late May. When Ursa Major is upright/square to the horizon, Aldebaran sits on the horizon in the East and Antares sits on the horizon in the west. Note Lone Cone’s resemblance to the profile of a face looking up (Chin on the left and forehead on the right). Oh, blessed vision! blood of God! 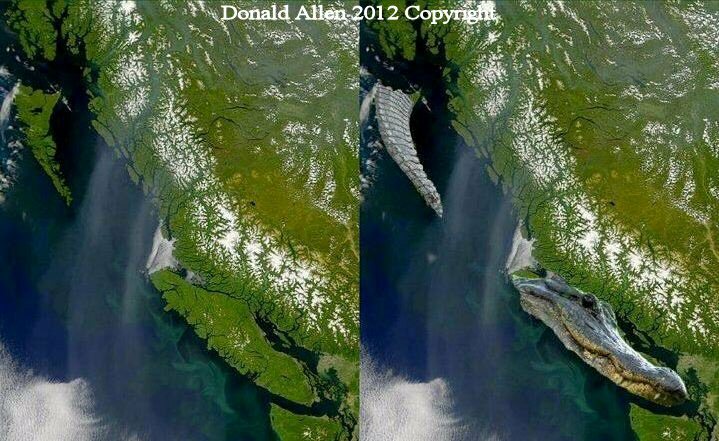 The image on the left is of a body of water called Lemmens inlet. The land surrounding Lemmens Inlet is Meares Island. Meares Island and Lemmens Inlet are located on the west coast of Vancouver Island. Vancouver Island itself is located on the west coast of British Columbia, Canada. I see Lemmens inlet as being shaped like Bambi, Rudolph or just some other young, male, cartoon like deer. 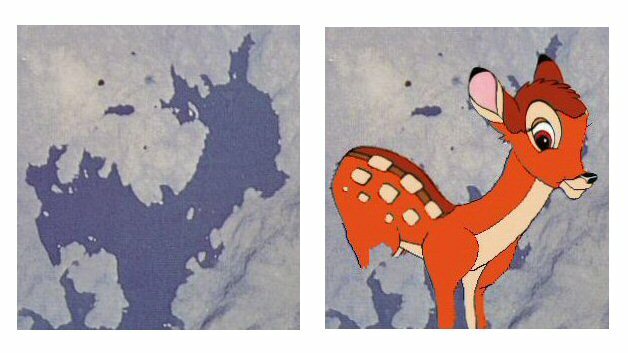 I could not draw the deer as I see it so I simply overlaid an image of Bambi so you can see what I mean. The deer’s head is quite clear. I see some little antlers but I did not draw them in on the Bambi image. I see the small island in the deers throat as a seed which will be explained later. I see the deer as having something like a collar around its neck with something like a bell on it. Notice how the dappling (dots) on the deers coat helps the lower half of its body blend into the picture making it look almost as though it is standing on the edge of the forest with only its head peaking out. Could there be something to this??? Refer next to the image of Meares Island and the Esowista Peninsula. I see Meares Island being shaped like a baby dragon hatching from its egg shell as it is being released from the Esowista Peninula which I see as an empty hand. Can you see the same Bambi/Rudolph/baby deer in the image on the left?? I will refer back to bite marks on the hand a little later. Like Draco the Dragon in our night sky which represents the Ladon Dragon wrapped around and guarding the apples of immortality in the Garden of the Hesperides, represented by our pole star Polaris, this Dragon is also wrapped around and guarding the apple of immortality represented by Hansen Island, the small red dot of an island around which this Dragon is wrapped. What are the first things that come to mind when you here the word dragon??? Time, eternity, immortality, earth, wind, fire, and water??? Guardian of hidden treasure? Magic? Change? How about China, karate and Bruce Lee??? The word karate means ‘the way of the empty hand’. In karate there are different hand signal for different weapons/stances. Two finger curled and two fingers out stretched is the karate hand signal ‘immortal man’ the ultimate karate hand weapon. Though wikipedia says that Esowista means “clubbed to death”, a Tla-o-qui-aht First Nations friend of mind told me it means “people of the clubbed fist”. Because this dragon has wings and is letting out a puff of smoke, it is a male fire breathing air dragon. So where is the female earth and water dragon??? Refer next to the image of Vancouver Island and Haida Gwaii. I see Vancouver Island as the head of an alligator coming up out of the water. The area around desolation sound/Johnston strait makes up the two bumps for her eyes looking toward Puget Sound, Washington, Victoria is as her nose, Cowichan lake her nostril and the rugged West Coast as her jaw/mouth/teeth. The alligators body is underwater and Haida Gwaii is as its tail lashing around. Known for their fury and ferocity, it is surprising to find that alligator are excellent mothers. They lay their eggs, and bury them but unlike turtles that swim out to sea leaving their young to fend for themselves, alligators guard their nests. When the eggs start to hatch, the mother alligator will dig up the nest and help her young emerge. Mother alligators are known to roll their eggs around in their mouths to help their young out of their egg shell. Coincidentally, our Meares Island dragon emerging from its egg shell is located in the mouth of this alligator. Check you maps/Google earth. The idea of a male fire breathing air dragon hatching/unfolding in the mouth of a female earth and water dragon has tie to the ancient concept of mother Goddess and her subordinate son lover. Mother Earth is the Goddess and we are her (not so) subordinate sons/daughters/baby dragons. Refer next to the image of North and South America. In the normal upright position, I see North and South America as a bat carrying a t-bone steak. Quebec, Labrador, New Brunswick and Nova Scotia make up the head of the bat. The Gulf of St. Lawrence makes up the mouth of the bat about to eat Newfoundland. Alaska, the Yukon, Northwest Territories and Nunavut make up the out stretched wings of the bat. Baja makes up the tail of the bat and Central America is as the feet of the bat carrying the T-bone steak (South America). 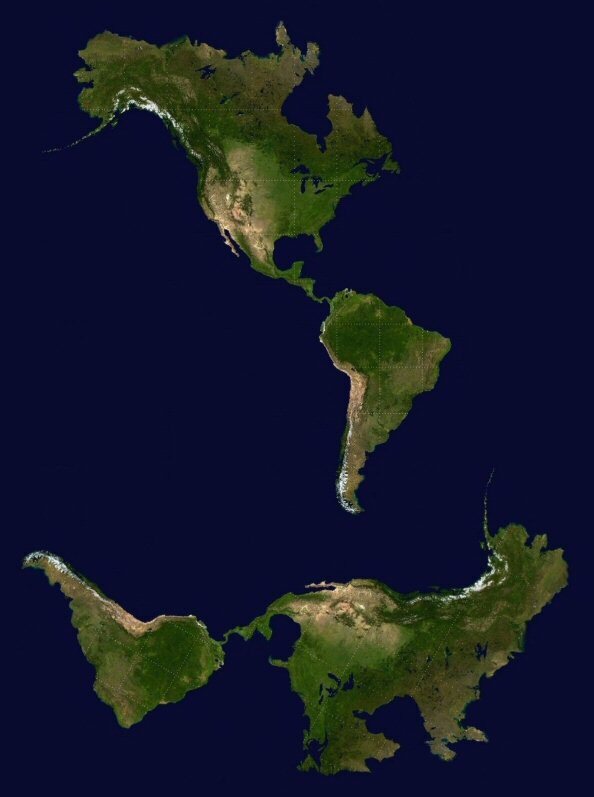 See what happens to North and South America when you turn them approximately 120 degrees clockwise. They become likened to an Oxen (with the body of a bear) pulling an old fashion plough. Argentina and Chile make up the handle of the plough, Brazil is the blade and Central America is the harness. North America is as the oxen. The Aleutian Islands are likened to the oxens horn. Do you think that it is at all possible that this bear bodied oxen pulling an old fashion plough could relate to Ursa Major (the big she-bear) who is also seen as the old fashion plough/wain and soup pot??? From one angle we have a creature eating a piece of meat well carrying an even larger piece of meat. From another angle we have a creature ploughing a field to grow vegetables. What does this all mean??? Refer to the next set of images of Meares Island and the Esowista Peninsula. Let me try to explain with the use of these 4 images. 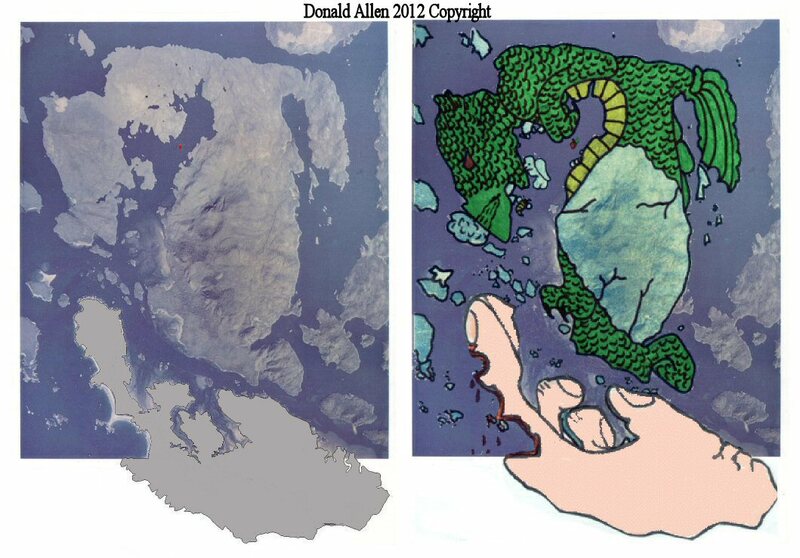 The first thing that I need you to do is notice the tiny island (Hansen Island) up Lemmens Inlet that I highlighted with a red dot in all 4 images( Sorry the red dot is so small and hard to see). In image number 1, we have Meares Island and the Esowista Peninsula with the little red dot/Hansen Island up Lemmens Inlet. The Esowista PENInSula is likened to the male reproductive organs and Lemmens Inlet is likened to a cross section profile of the female reproductive organs with Hansen Island as the seed inside the womb. Meares Island itself is shaped like a womb carrying a with child and fallopian tubes giving birth into the receptive open hand. In image number 2, I see Hansen Island as a seed in the deer’s throat (or Bull’s-eye for the hunters out there).. In image number 3, I see Hansen Island as the apple of immortality in the Garden of the Hesperides around which the Ladon Dragon is wrapped around and guarding. 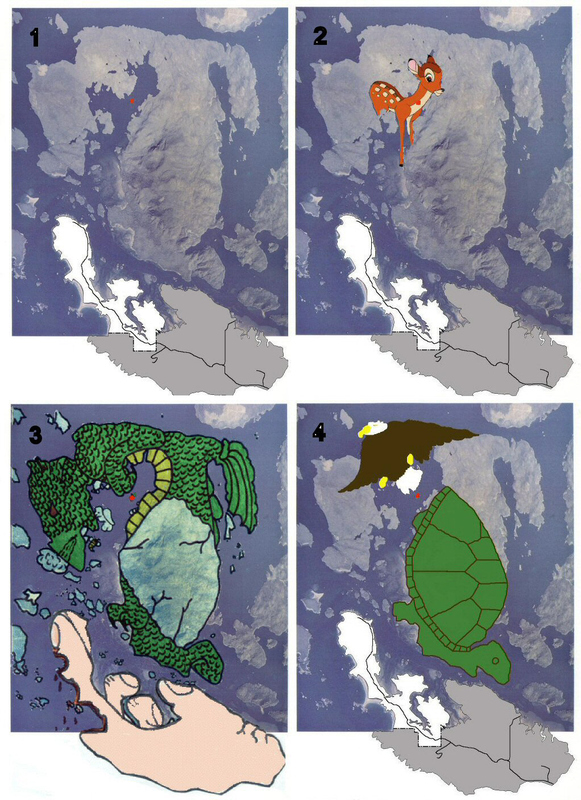 In image number 4, I see Hansen Island as single cell/atom/molecule out of which an Eagle is flying up to the Heavens and a Turtle is moving down towards the Earth. So where did the Eagle and Turtle come from? This is the break down of the Dragon. In my studies, dragons are often depicted as being four in number, one being associated with each of the four elements earth, wind/air, fire, and water. The earth and water dragons represent the female elements and the air and fire dragons represent the male elements. This is shown where the area that makes up the Dragon’s shoulder, arms, claws and chest (the Heart of the Dragon) also makes up an eagle soaring up toward the heavens. It is as if it were the male warrior spirit/soul in the heart and mind of the dragon trying to escape its physical body and fully merge with spirit. It is this male drive that gives the Dragon its flight. I see the bulk of the Dragon’s body which includes its legs and tail still curled up and covered in egg shell as a turtle moving down toward the earth. It is as if the ‘down-to-Earth’ grounding female energy (the water/blood and earth/flesh) side of the dragon is keeping the spirit/soul manifested in the physical world. Notice how the Eagle and Turtle seem to be expanding outward from the ‘seed/atom/molecule’ (Hansen Island). Eagle represents wind and fire (or air and spirit ) which are the male elements making up the dragons male side. The turtle represents earth and water which are the female elements, making up the dragons female side, hence the dragon is a flying (eagle) reptile (turtle). Eagle teaches us to live in the realm of spirit, yet remain connected and in balance with the earth. Turtle teaches us that the way to “heaven” is through the earth. We have everything we need to experience mental, physical, emotional and spiritual bliss (heaven or paradise) is right here on earth and our humanness, being in these physical bodies, is a neccesary part of this experience. We have “heaven” right here on earth. We need only to open our mind’s eye/inner eye/third eye to see it. Up to the Heavens, down to Earth. As Above, so Below. The night sky/the Heavens reflected on the Earth. The exploration of astrological and mythological archetypes through landscape effigies.